Last November 7, Typhoon Haiyan (Philippine name: Yolanda) struck the Central Philippines, causing unprecedented damage and affecting approximately 13 million people. The UN places the current death toll from the typhoon at 4,200 and is still rising as lines of communication and transport routes are slowly restored. International aid organisations and governments together with the Philippine government and people are now heavily involved in ongoing disaster relief operations to provide food, shelter, treatment and other necessities to help the typhoon’s survivors. The APERTURE Festival Team would like to show our support to the Filipino people by finding ways to help in these trying times. We’ve decided to partner with the Philippine Psychiatric Association, which is in the process of mobilizing health professionals to provide psycho-social support to the typhoon’s survivors. In the spirit of unity, we are appealing to you for any donations for the typhoon’s survivors. The APERTURE Festival Team will be collecting donations on our Opening Day – Thursday, November 21 2013. Alternatively, donations can be made through a Paypal account (linked below) that we’ve set up specifically for this cause. Thank you. 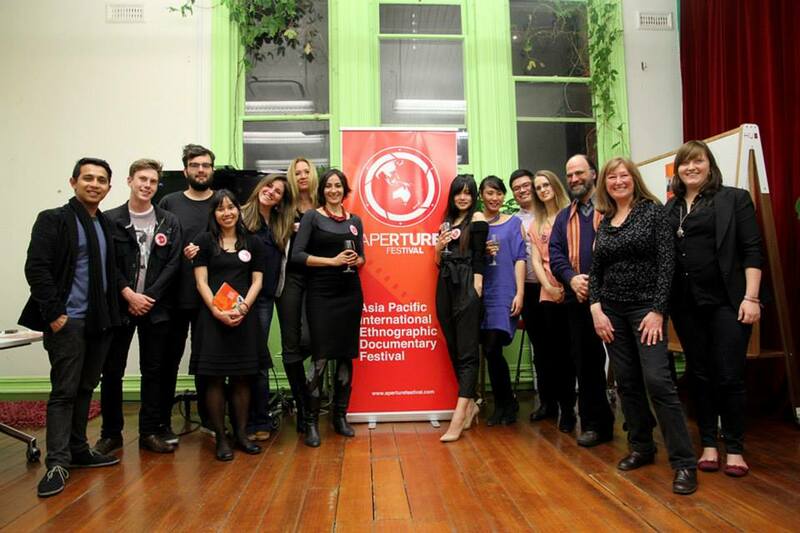 On Friday October 25th APERTURE Festival had its official Festival Program Launch Party at The Hub. It was a resounding success with media partners, Pozible supporters, APERTURE Fest Ambassadors, Filmmakers and the APERTURE team in full attendance to celebrate our successful Pozible Campaign and the countdown to the Festival. Check out photos from our Launch Party on this photo gallery. Also we were interviewed by MELD Magazine. See the video below to watch our interview! 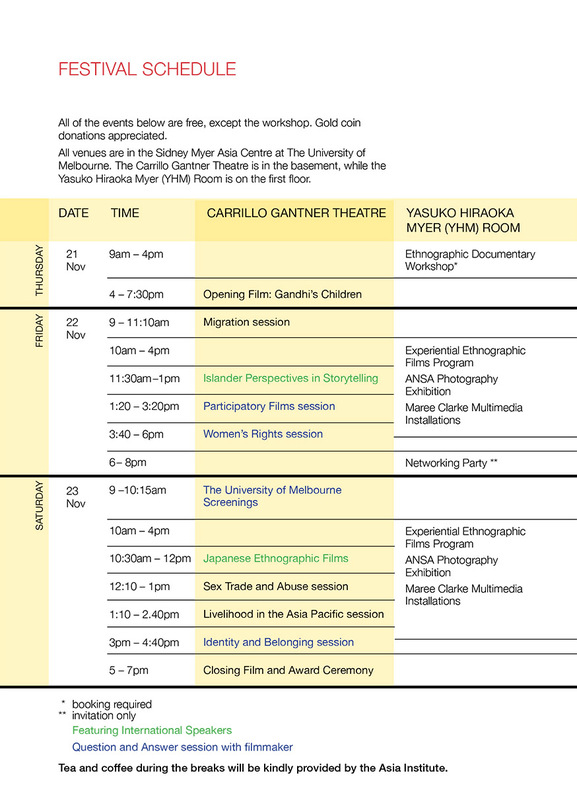 Running for three days (21-23 November) at the University of Melbourne, APERTURE Festival is the first ethnographic documentary festival in Australia and worldwide with an Asia Pacific focus. Over 30 films will be on shown at the inaugural APERTURE Festival from over 15 countries across the Asia Pacific, including 4 world premieres and numerous Australian and Melbourne premieres. The festival also includes international speakers, photography exhibition and multi media installation. APERTURE Festival is not to be missed! You can download the full program on festival booklet or check out this one page festival schedule to plan your time at the festival. All entry will be free or you can get your free tickets now. If you thought that APERTURE Festival was just another documentary festival-YOU’RE WRONG! 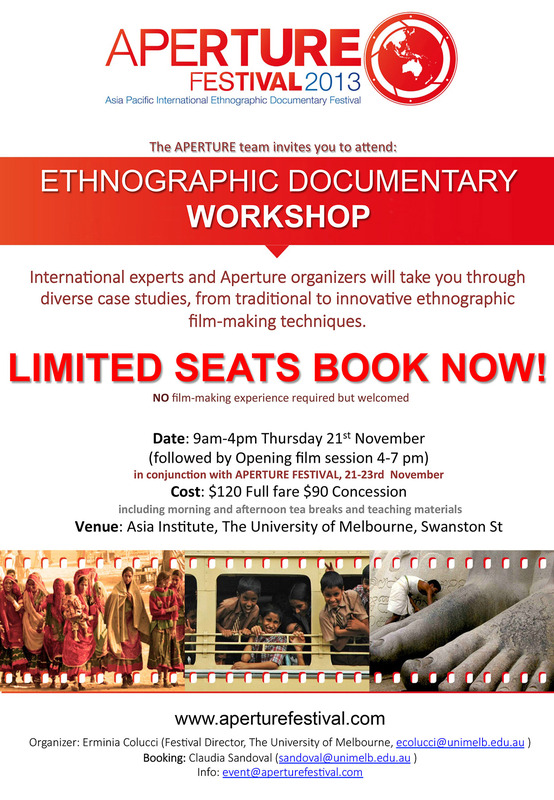 We are also all about knowledge exchange and helping others with an interest in ethnographic documentary develop their skills. Spaces are limited so book in early. For more information click the flyer or check out our website here. As many of our followers probably already know, we have successfully reached our Pozible Campaign target of $2500! In fact we went over our target with a final total of $2795! We cannot express to all our friends, family and our friendly supporters how much this means to us and how much of a difference this will make to the 2013 Aperture Festival. With less than 2 hours to go we received a generous donation from Hand Up Australia which helped put us over our target goal. Hand Up Australia is a social enterprise that offers transformative and world-class international volunteer programs to youth and adults.